At age 15 I worked in a wine store after school sweeping floors, restocking shelves – just being a store hand. I really got involved when working as a laborer for a bricklayer. We were building a new winery complex at Yering Station in the Yarra Valley and I needed more than the three days a week work so we organized for me to work in the cellar door of the winery for three days too. It was great exposure to wine. The winemaker at the time was Tom Carson, a great resource to answer every question I had no matter how small it was. He makes pretty decent wine too! Communication is key to determine where your customer wants to go in the short amount of time you have at the table. Listen to their needs and take them on the path they want to go. Sometimes it’s exciting other times they want to be safe. I had the pleasure of working alongside Ruben Sanz Ramiro in New York for a few years. His passion and dedication to wine is amazing and such a great person all round. Get your hands dirty and be prepared to do anything to get your foot in the door. The current economy has meant more Somms need to take on a dual role of manager and sommelier. It’s the behind the scenes motivation that gets you places. Take the deliveries, clean the cellar, lug boxes up the stairs. Learn to serve tables so you get to know the timing required when the Somm should approach the table and make the most of the guests experience. Taste, network and be humble. Ascertain what direction they want to go – do they want a wine to pair with their meal, just a great wine, something fun and new they haven’t tried before or a wine that’s more classic and safe for them. Once you have this information you can offer three selections of an appropriate style of wine at various price points to leave the final deduction to the guest. Use reputable stems and keep them clean! You don’t need every shape offered but it’s nice to have a different glass for the more premium wines. A beautiful glass adds to the occasion. We work with Rona – you need to take into account your customer demographic, budget for breakages, style of list you’re working with and the feel of the restaurant. For example, Riedel Sommelier range glasses in an a east village dive bar would look out of place. Be creative and have fun. Think outside the box. Keep it in line with the style of restaurant, food being served and appeals to your clientele. Keep the list manageable – don’t have a huge list if you don’t have time to reprint 86’s daily. Price wise your perceived value of the wine goes a long way. Taste the wine, look at your list and judge what you would feel comfortable paying for this wine in the restaurant environment. If your profit margin to quality quality perception is too slim it’s probably not a good for for the list. As a Sommelier you are responsible to meet financial expectations of the restaurant. As long as you feel guests are getting the true value of drinking the wine then mark ups are subjective. I have always used a sliding scale with lower percentage mark up on premium wines. Taste, read, talk and mingle. Leave a bottle to drink with staff after work. 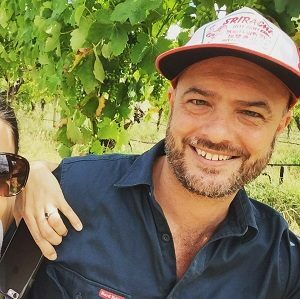 Australian Riesling – dessert island for sure!